Right after it’s announced that The Shape of Water has won Best Picture, Wolfgang Puck’s team at the Dolby Ballroom—they’ve been watching the show on a TV in the kitchen—kicks into high gear. 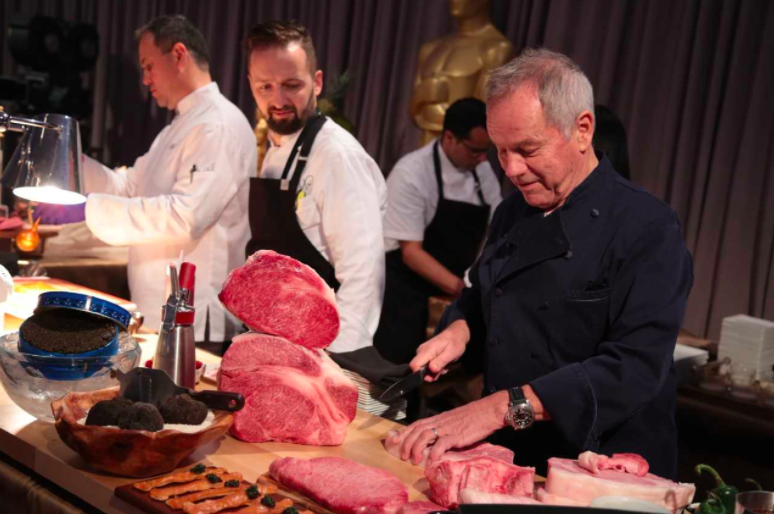 The restaurant titan just finished his 24th consecutive year of cheffing the Oscars with his company, Wolfgang Puck Catering. During that time, the Best Picture announcement has become the cue that the awards ceremony is drawing to a close, and plates should be fired. Like clockwork, Puck’s team of executive chefs—some of whom have flown in from as far as Turkey, just to have the honor of spooning caviar onto Oscar statue-shaped matzo 2,400 times over—stand at their line stations and work together like a well-oiled machine. The imported Miyazaki Wagyu beef, which has been flash-grilled a couple hours before, is finished off; the filling for truffled chicken pot pies, which has been ladled into ramekins, is covered with puff pastry. Every single dish—save for those on the sushi and dessert bars—is fired on the spot. Trays after trays of tartare, made with the uber-marbled Miyazaki Wagyu, are topped with togarashi. There are deeply pink hibiscus buds: if you look closely, you'll see lump crab meat stuffed within. There are "tiny taro tacos"—impossibly cute, stuffed with eggplant and pickled lime. There are hot dishes, of course, passed trays of twice-baked potatoes topped with caviar—15 kilos total, before the weekend is through—and the aforementioned personal pot pies, their puff pastry cumulonimbus. (Apparently the pies are Meryl Streep’s favorite; John Travolta is a fan of the mac and cheese.) The list of dishes are endless, many of them containing the aforementioned black truffle: $42,000 worth of it, at $1200 a pound. The Governor’s Ball used to be a sit down multi-course meal, but in recent years, it’s become a passed-plates-only event. Guests didn’t want to sit down for another two hours after sitting for three during the ceremony; this way, there’s more of a party vibe. While the Oscars—more formally known as the Academy Awards, now in its 90th year—has become Puck’s touchstone event, the reality is that his celeb reach far precedes his involvement with the ceremony. The story really begins with his flagship restaurant Spago, which the Austrian-born chef launched in 1982 in Los Angeles. By the mid-‘80s, it had quickly become a hotspot for Hollywood A-listers like Dinah Shore, Warren Beatty and Billy Wilder, all regulars at the restaurant. Although these days Spago tends to get eclipsed in the media by L.A.’s hot restaurants du moment—Evan Funke’s Felix, Jordan Kahn’s Vespertine, older standby’s like Walter and Margarita Manzke’s République and Travis Lett’s Gjelina—it’s indispensable to the city’s dining history, and to California cuisine in general. Not only that: Puck helped shape the very concept of American dining in this country, pioneering the open kitchen concept and using then-exotic ingredients like goat cheese and smoked salmon on his pizzas. Remember, this was the ‘80s. These are moves that started trends, way more than people realize. Before we go into that, however, an anecdote. A few years ago in 2013, after Jennifer Lawrence won her Best Actress Oscar for Silver Linings Playbook, Puck congratulated her at the Governor’s Ball after party. “Who’s that?” she whispered to her publicist. He told her. To be fair, middle America is more likely to associate Puck with his eponymous bar and grill, pizzeria and bistro concepts than his foundational fine dining concepts like Spago or Chinois. The latter basically pioneered chef-driven fusion cooking. (Although Puck got his share of hate mail from detractors, he says, who said a Caucasian chef could not, and should not, attempt to cook Chinese food.) Today, the chef is in 80 airports and has six restaurants in Las Vegas alone. He’s also found substantial commercial success with his CPG (consumer packaged goods) brand, found in grocery stores. Still, make no mistake: it’s his flagship Spago that established him as one of the foundational chefs of contemporary American fine dining—and helped him create the idea of the celeb chef along the way. We’re sitting in his crowded office at the Dolby Ballroom kitchen on the Friday morning before the Oscars. There are papers everywhere. There's a half filled coffee pot and styrofoam cups; we’re halfway through the interview before we notice the presence of another gentleman in the room, hunched over a desk. He's the accountant. These are humble surroundings for the 68-year-old über-chef, but he doesn't seem to mind. His sleeves are rolled up, and he's here to work. He’s been up since 4 a.m.; first to shoot a Good Morning America segment, and then to come to prep in the kitchen. In between, he drove home to cook breakfast for his two kids, Alexander, 11, and Oliver, 13. He took a short acting sleeping pill before bed, he tells us—otherwise, he’d just keep thinking about kitchen to-do’s. We go back to talking about the early days of Spago. “I wanted to supervise the whole restaurant and see what’s going on in the dining room,” Puck says, talking about his open kitchen concept. “I didn’t want to be stuck in the kitchen.” It wasn’t a statement or a show off move; it was a practical decision. But it turned out to be a game changer. In removing that fourth wall at Spago, Puck eliminated the barrier between patron and chef, and began to interact more with his customers, many of them Hollywood A-listers. They’d wave to Puck—the kitchen was the first thing you saw walking in—and ask recommendations for what fish they should order that night. In the process, two things happened: his personality came to represent the restaurant, even as the quality of the dining spoke for itself. Spago became, truly, a chef-driven enterprise: the chef was its public image. 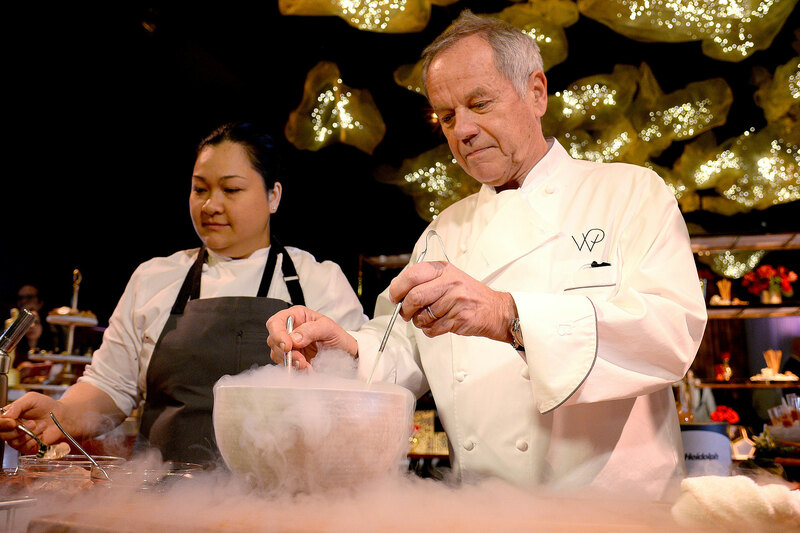 People came there for Wolfgang Puck, not just for his food. Despite Puck’s local success and celebrity buzz, national T.V. had still been eluding him. His publicist at the time had landed him on local shows like A.M. Los Angeles, but Good Morning America hadn’t been interested. They already had Julia Child, they told Puck; apparently, there was only room for one chef cooking European-ish cuisine. That changed with Mike Ovitz, the founder of Creative Artists Agency (CAA), one of the biggest talent agencies in Hollywood. He was having dinner at Spago one night, and learned of the matter. He made a phone call. The next day, Good Morning America asked to meet with Puck. Since then, Puck has appeared on several shows, even in a few movies. In 2000, at the dawn of food media 2.0, he debuted his own cooking show on the then-new Food Network. Called Wolfgang Puck’s Cooking Class, it lasted for five seasons. But his television presence got gotten eclipsed, perhaps, by other T.V. personalities like Emeril, Rachel Ray and the testosterone-filled Guy Fieri. But no matter. Today, Puck is more successful than ever, as defined by the commercial success and number of his worldwide concepts, and his lasting culinary legacy. At 68, he owns 25 fine dining restaurants worldwide—his global expansion was expedited by fears of another American recession—including the most recently opened CUT steakhouse in Doha, Qatar. His flagship Spago—which helped popularize goat cheese and smoked salmon pizzas, hyper on-trend concepts at the time—is still alive and kicking in Beverly Hills. Last year, he got inducted into the Hollywood Walk of Fame. Fittingly, it’s in front of the Hollywood and Highland Center, which houses the Dolby Theater where the Oscars are held. Amidst this empire that he’s built, the Oscars are just one jewel—admittedly, the most visible. But at the end of the day, Wolfgang is—surprisingly, perhaps—still a chef. One who wakes up at 4 a.m. to start work in a kitchen, and who will be probably just a little bit relieved that his 24th Oscars are finally over.